So today I wanted to do a 1940s working girl or pin up inspired hair and make up. First I wanted to say, props to all those 1940s women who took over many of the male dominated jobs in the factories and on the land, while the men were fighting in World War 2! This was such a huge deal in American history because this was the first time that women were working outside of the household. Because of this, make up and hair had to be quick and fuss free, thus the compact make up was born or should I say pan-cake make up which was designed by Max Factor. Make up allowed women to still feel feminine while they were working these masculine jobs. Red lipstick was a staple, not only did it help boost morale, but it also represented the dual role of women needed during the war. Red lipstick was the color of the decade and was usually matte along with lip liner(which didn’t make their mark til the 50s) Once lipstick was applied, women would then apply petroleum jelly or Vaseline to lips to give it that sheen look and protect the lips. If red lipstick became scarce, since everything was rationed during the war, women would use beet juice. Hair was usually kept short and pinned up. Either in pin curls or victory rolls, then a scarf would be placed over the hair not only to protect it from working in factories, etc, but to also help them maintain a feminine appearance. After work the scarfs would come off and the pin curls released for an evening look. So as you can see this is it typical to the modern pinup that we know today. The cat eye or eyeliner flick wasn’t even introduced til the 50s. Pretty cool stuff! I’m am seriously so infatuated with the history of this make-up style. As I was researching it I was expressing my amazement by saying “wow!” after every other sentence I read. 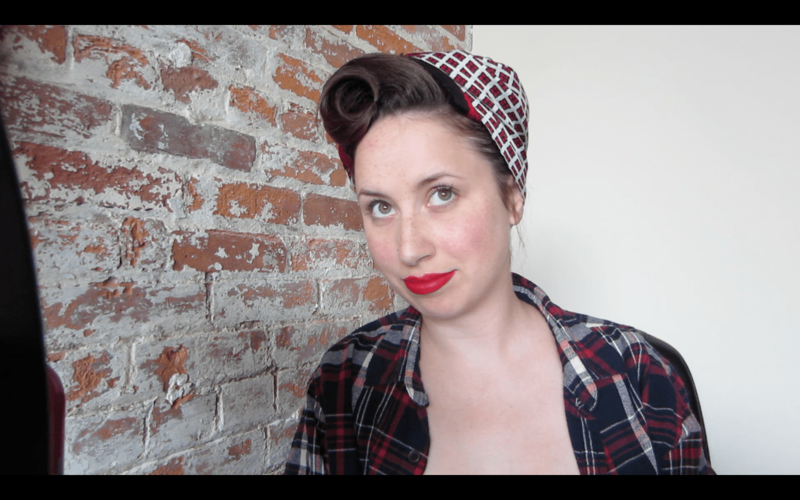 So of course I had to play around with some make-up to recreate the 1940s working woman look and I figured I’d share it with ya’ll ! Also, if you guys are interested in learning more about the 1940s, 1940s women looks/styles, or any other vintage styles, there are a lot of amazing websites and blogs out there like GlamourDaze.com !